Objective: To assess the impact of a one-day clinical toxicology workshop in improving knowledge.Methods: A one-day clinical toxicology workshop was conducted as a pre-conference workshop of the Annual Emergency Medicine Conference at the Aga Khan University Hospital, Karachi, in April 2012. The course was composed of poisoning-related common clinical scenarios. The pre-test and post-test understanding was used to assess the impact of the course in improving knowledge. The participants also evaluated the workshop as a whole thorough written evaluation forms. SPSS 19 was ued for statistical analysis of the data.Result: There were 22 participants in the course. The pre-test mean score was 31.6±15.1% (95% CI; 24-40; n=19) compared to the post-test the mean score of 56.0±10.8% (95% CI; 47- 61; n=17). 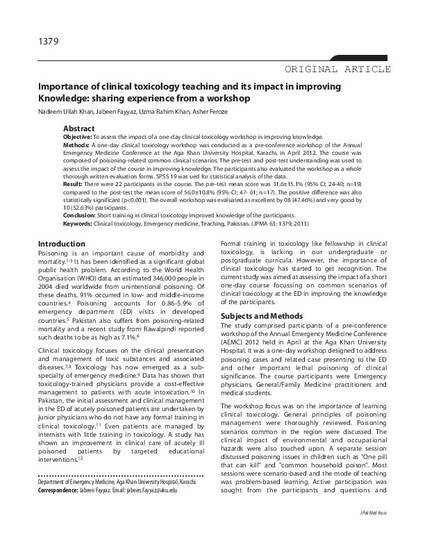 The positive difference was also statistically significant (pConclusion: Short training in clinical toxicology improved knowledge of the participants.